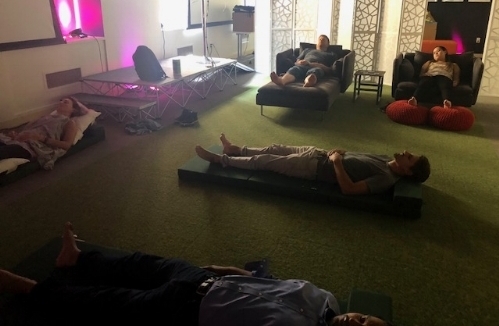 Mesosphere employees in downtown SF enjoying the benefits of acupuncture during an onsite wellness event. If you work for an employer offering corporate wellness benefits you may already be familiar with the positive impact health maintenance has not only on employee morale but also on work performance and attendance. Wellness programs have been shown to raise employee engagement levels because as workers become more fit and healthy with opportunities to decompress and reduce stress, they feel supported, are more productive, and increase bottom line revenue for their managers and employers. It has been estimated that for every dollar spent on employee wellness initiatives, up to $3 is saved in health care premiums and $2 in absenteeism. This is nearly a 300 percent ROI, and it’s hard to find any corporate benefit expenditure that compares. With busy home and work schedules, most employees do not make time or even know about regular self-care treatment like acupuncture. We bring these benefits to your business, offering onsite wellness services at a low cost per employee so they can experience immediate pain and stress relief and also get motivated to include these treatments in their regular routine. Onsite wellness services include acupuncture, chair massages, meditation sessions, yoga instruction and more and can be offered at a reduced/no-cost to employees at a special wellness event day. If you are an employer, you and your management team carry a lot of daily responsibility and stress so it’s important to receive the care you all need to lead by example. Schedule management wellness days at your office, health spa or local conference center, bringing in speakers and wellness practitioners at a reduced group rate. We can help your company get healthy! Contact Amie to get more information and pricing for onsite corporate wellness events.